The privately owned U.S.-flag foreign trading fleet, which is an essential component of U.S. sealift capability, stands on the edge of a precipice. The fleet – roughly stable in terms of cargo carrying capacity from 2000 to 2012 – has declined from 106 vessels in 2012 to 78 vessels at October 30, 2016 primarily because of a substantial decline in available U.S. Government-reserved cargo. The size of the fleet has reached a point where the viability of the U.S.-flag industry involved in foreign trade – including its trained mariners, maritime academies and schools, and experienced back office personnel – is in danger of disappearing. As the cargo decline is not likely to be reversed any time soon, the fleet will likely only survive into the future if there is a substantial, renewed national commitment to sustain it. This alarm bell has been rung before. In fact, it has been wrung over and over ever since the foreign trading fleet began to decline at about the time of the Civil War. For example, the U.S. Naval Institute Proceedings published an article in 1882 by Lt. Cmdr. F.E. Chadwick, USN, entitled “Our Merchant Marine: The Causes of Its Decline, And the Means to Be Taken For Its Revival.” Scientific American devoted its entire July 15, 1911 issue to the question “Shall We Have a Merchant Marine?” (answered by all the authors including the U.S. Secretary of Commerce and Labor in the affirmative). Prof. Andrew E. Gibson, of the Naval War College and the former Assistant Secretary of Commerce for Maritime Affairs in the Nixon Administration, wrung the alarm bell on numerous occasions including “So Long, American Flag – It Was So Nice to Fly You” in the Naval War College Review in 1993. These are but a small sample of the pleas for help. What is different today is that the foreign trading U.S.-flag fleet has shrunk to the point that any further substantial decline is likely to make the situation irretrievable. As Vice Admiral William A. Brown, Deputy Commander of the U.S. Transportation Command, testified before Congress on July 30, 2014: “we are concerned that we may be coming closer to a tipping point where our ability to man some of the surge fleet would be at risk ....” At that point in time, the U.S.-flag foreign trading fleet was 83 vessels – it declined another five vessels by the end of October 2016. When Prof. Gibson wrote that we were saying goodbye to the U.S.-flag flying on vessels in foreign trade there were 176 such vessels. Capt. Paul N. Jaenichen, Sr., USN (retired), the outgoing U.S. Maritime Administrator, has testified before Congress on several occasions to the effect that the fleet decline is endangering the U.S. ability to meet its sealift requirements. For example, he stated in a Congressional hearing on November 17, 2015 that we are already “on the very hairy edge” of lacking the manpower to man reserve defense sealift vessels (which only have partial crews until activation). What is particularly alarming is that it is not at all clear that the manpower pool can be readily redirected from existing commercial employment to manning reserve vessels. There are a number of historical examples when the pool size appeared more than adequate but it was still difficult to draw on the pool in an emergency sufficient to meet all vessel activation needs. For example, personnel shortages caused delays in about 40 percent of scheduled sailings during the Korean War when the manpower pool reserve was substantial. In 1990, when the privately owned fleet was much larger than it is today, putting half the reserve fleet in operation exhausted the supply of mariners. The existing pool is also likely to be negatively impacted by the International Convention on Standards of Training, Certification and Watchkeeping for Seafarers, 1987 (STCW) which imposes new, stringent marine credentialing requirements effective January 1, 2017. 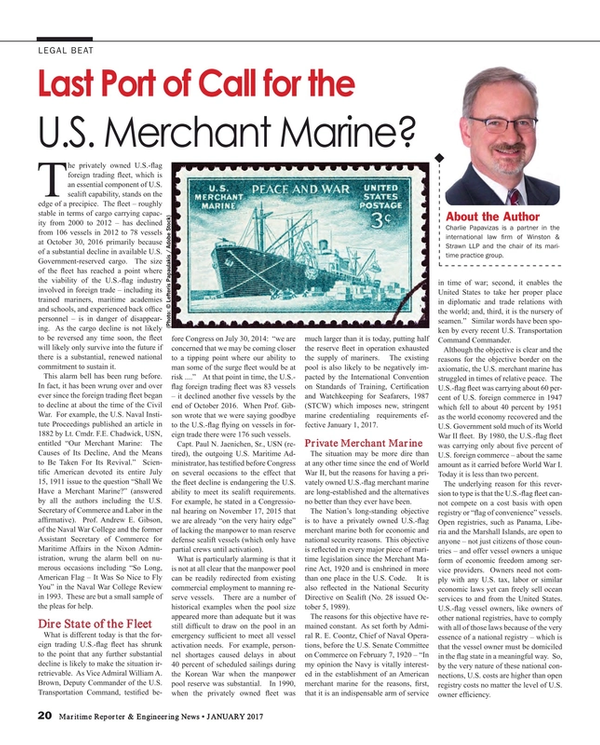 The situation may be more dire than at any other time since the end of World War II, but the reasons for having a privately owned U.S.-flag merchant marine are long-established and the alternatives no better than they ever have been. The Nation’s long-standing objective is to have a privately owned U.S.-flag merchant marine both for economic and national security reasons. This objective is reflected in every major piece of maritime legislation since the Merchant Marine Act, 1920 and is enshrined in more than one place in the U.S. Code. It is also reflected in the National Security Directive on Sealift (No. 28 issued October 5, 1989). The reasons for this objective have remained constant. As set forth by Admiral R. E. Coontz, Chief of Naval Operations, before the U.S. Senate Committee on Commerce on February 7, 1920 – “In my opinion the Navy is vitally interested in the establishment of an American merchant marine for the reasons, first, that it is an indispensable arm of service in time of war; second, it enables the United States to take her proper place in diplomatic and trade relations with the world; and, third, it is the nursery of seamen.” Similar words have been spoken by every recent U.S. Transportation Command Commander. Although the objective is clear and the reasons for the objective border on the axiomatic, the U.S. merchant marine has struggled in times of relative peace. The U.S.-flag fleet was carrying about 60 percent of U.S. foreign commerce in 1947 which fell to about 40 percent by 1951 as the world economy recovered and the U.S. Government sold much of its World War II fleet. By 1980, the U.S.-flag fleet was carrying only about five percent of U.S. foreign commerce – about the same amount as it carried before World War I. Today it is less than two percent. The underlying reason for this reversion to type is that the U.S.-flag fleet cannot compete on a cost basis with open registry or “flag of convenience” vessels. Open registries, such as Panama, Liberia and the Marshall Islands, are open to anyone – not just citizens of those countries – and offer vessel owners a unique form of economic freedom among service providers. Owners need not comply with any U.S. tax, labor or similar economic laws yet can freely sell ocean services to and from the United States. U.S.-flag vessel owners, like owners of other national registries, have to comply with all of those laws because of the very essence of a national registry – which is that the vessel owner must be domiciled in the flag state in a meaningful way. So, by the very nature of these national connections, U.S. costs are higher than open registry costs no matter the level of U.S. owner efficiency. This cost difference between open registries and national registries can be addressed and reduced, but it cannot be eliminated without eliminating the essence of a national registry. No amount of efficiency is going to reduce the wages of qualified U.S. citizen mariners to a world scale level in the present day economy. U.S. Government support is therefore a necessity for the maintenance of a privately owned U.S.-flag commercial fleet. The only alternatives are reliance on the foreign market or a U.S. Government-owned fleet. Although the context has changed over time, the question about whether to have an intrinsic American commercial capability or to rely on the vessels having no loyalty to the United States has not changed. The question was posed by John Jay in 1785 when he was Secretary of Foreign Affairs in the Confederation federal government: “Whether it would be more wise in the United States to withdraw their Attention from the Sea, and Permit Foreigners to fetch and Carry for them; or to persevere in concerting and pursuing such Measures as may conduce to render them a maritime Power?” The United States learned hard lessons in the late 19th and early 20th centuries about what it meant for the projection of sea power to rely on foreigners to “fetch and carry” for the U.S. Government. Admiral Dewey almost missed his appointment with history because of a late foreign supply vessel, the United States barely scrounged together enough cargo vessels to invade Cuba in the Spanish American War, and Teddy Roosevelt’s Great White Fleet depended almost to the point of national embarrassment on foreign colliers to circumnavigate the globe. Then, in the lead up to U.S. involvement in World War I, the U.S. economy suffered greatly because of a lack of available tonnage to carry U.S. products. This occurred because the Allies chartered every vessel they could, the Germans sank as many Allied vessels as they could and war risk insurance rates skyrocketed even for neutral vessels. Half measures (such as permitting foreign-built vessels to come under the U.S. flag during a time when only U.S.-built vessels could be registered in the U.S.) proved insufficient. This led eventually to the Shipping Act, 1916 and a crash U.S. Government program to build vessels to support the economy and for the war effort. This may all seem like ancient history, and in many ways it is, but there are plenty of modern examples of situations where an extension of national power was thwarted or delayed because of reliance on vessels without loyalty to the government charterer. There are many instances, for example, that occurred in the Vietnam War during the height of its international unpopularity where foreign ships balked at carrying U.S. military cargo. The sealift operations during Operations Desert Shield/Desert Storm succeeded in large measure because of the broad international coalition supporting the effort and even then certain allies were slow to commit vessels. Future scenarios where the United States might have to go it alone, for example in its support of Israel, can easily be conjured where open registry vessels may refuse to participate regardless of the charter rates. In support of Operations Desert Shield/Desert Storm, the U.S. Government was forced to charter “virtually every available vessel in the world capable of moving heavy equipment.” The United States was fortunate that the world was united in support of those operations and that the vessels were available for charter. That might not be the case the next time. For example, more of the world’s commercial fleet has come under the control of Chinese interests since the early 1990s. The fleet under Chinese flag (including Hong Kong) comprised approximately nine percent of the world’s fleet in terms of deadweight tonnage (a measure of carrying capacity) as of December 31, 1991 and about 13 percent as of January 1, 2015. U.S.-owned vessels registered under foreign flag consisted of about three percent of the world’s fleet by the same measure as of January 1, 2015. These vessels offer some comfort since many, if not most, of these vessels are registered in countries, such as the Marshall Islands, which have agreed not to interfere with the requisitioning of such vessels by the U.S. Government in the event of a national emergency – referred to as the “Effective U.S.-Controlled Shipping Fleet.” Although potentially useful in the event of a worldwide embargo or other economic emergency, these vessels are all manned by non-U.S. citizens and therefore their reliability is suspect even with U.S. ownership and, in any event, do not provide employment for U.S. citizen mariners needed to man Government-owned vessels. This is Part 1 of a two part series. Part 2 will appear in the February 2017 edition of Maritime Reporter & Engineering News. U.S. Maritime Administration web site (Resources – Maritime Statistics). E.g. Clinton H. Whitehurst, Jr., “Last Clear Chance for an Enduring Maritime Policy,” The Strom Thurmond Institute (1998). U.S. House of Representatives, Comm. on Armed Services, Subcomm. on Seapower and Projection Forces, Hearing on Sealift Force Assessment (July 30, 2014). U.S. Maritime Administration, A Report to Congress -- Impacts of Reductions in Government Impelled Cargo on the U.S. Merchant Marine at 49. U.S. House of Representatives, Comm. on Agriculture, Subcomm. on Livestock and Foreign Agriculture and Comm. on Transportation and Infrastructure, Subcomm. on Coast Guard and Maritime Transportation, Hearing on Food Aid Transportation (Nov. 17, 2015). Louis Francis Harlow, “An Analysis of the National Defense Reserve Fleet, the Ready Reserve Force Component and Their Capability to Meet National Emergency,” Naval Postgraduate School (Sept. 1979) at 29. Andrew E. Gibson, “So Long, American Flag – It Was So Nice to Fly You,” Naval War College Review (Autumn 1993) at 50. 46 U.S.C. § 50101; 50 U.S.C. § 4401. U.S. Senate, Comm. on Commerce, Hearing on Establishment of an American Merchant Marine (Feb. 7, 1920) at 1011. E.g., Statement of Gen. Paul J. Selva, Commander, U.S. Transportation Command to the U.S. Senate Armed Services Comm. (March 19, 2015). Econometrica, Inc., Final Report: Maritime Security Program Impact Evaluation, Submitted to the U.S. Maritime Administration (July 2009) at 45. John Jay (Secretary of Foreign Affairs) to John Adams, November 1, 1785, in Correspondence and Public Papers at 175. Samuel A. Lawrence, United States Merchant Shipping Policies and Politics, The Brookings Institution (1966) at 33-34. James R. Reckner, Teddy Roosevelt’s Great White Fleet, Naval Institute Press (1988) at 104-105. E.g. Lane C. Kendall, “‘Capable of Serving as a Naval and Military Auxiliary . . .’” U.S. Naval Institute Proceedings (May 1971) at 219. Andrew E. Gibson and Commander Jacob L. Shuford, USN, “Desert Shield and Strategic Sealift,” Naval War College Review (Spring 1991) at 16. Andrew E. Gibson, “After the Storm” Naval War College Review (Summer 1992) at 22. UN Conference on Trade and Development, Review of Maritime Transport 1991 and 2015. Lawrence, United States Merchant Shipping Policies and Politics at 39-40. Harlow, “An Analysis of the National Defense Reserve Fleet” at 29. U.S. General Accounting Office, Strategic Sealift – Part of the National Defense Reserve Fleet is No Longer Needed (Oct. 1991) at 3, 8. U.S. House of Representatives, Comm. on Armed Services, Subcomm. on Seapower and Projection Forces, Hearing on Logistics and Sealift Force Requirements and Force Structure Assessment (July 30, 2014) at 42. Gibson & Shuford, “Desert Shield and Strategic Sealift” at 12-14. Harlow, “An Analysis of the National Defense Reserve Fleet” at 27. U.S. Maritime Administration, A Report to Congress Impacts of Reductions in Government Impelled Cargo; U.S. House of Representatives, Hearing on Food Aid Transportation. Salvatore R. Mercogliano, “The United States Merchant Shipping Offensive During the Second World War,” The Northern Mariner (Oct. 2001) at 30. Charlie Papavizas is a partner in the international law firm of Winston & Strawn LLP and the chair of its maritime practice group.